There’s a garden nestled on Palethorpe Street within North Philadelphia’s narrow, twisting roads. It’s called Las Parcelas. There are houses painted in vibrant yellows and blues dotting the landscape. The garden has carefully placed stepping-stones, hanging lights and colorful wall murals. There’s even a pit for pig roasting. This is no ordinary garden. Formally, the space was occupied by 21 row houses and is now the home of 32 garden plots. It’s a product of the Norris Square Neighborhood Project (Norris Square), which has used its programming and six vast gardens to invigorate and feed the community for four decades. And on June 16, it was the site for Norris Square’s Festival de Bambulaé, a vivid garden celebration and fundraiser. Rafael Álverez, Norris Square’s Director of Garden Programs. “It’s an opportunity for the Puerto Rican community to share its culture with people throughout Philadelphia,” says Rafael Álverez, Norris Square’s Director of Garden Programs. While youth leaders help community elders lay out table clothes, make guacamole and test microphones for the many Philadelphians to come celebrate later that day, it’s difficult to imagine what Norris Square’s gardens looked like 40 years ago. Something had to be done to counter the violence, the trash dumping and the destruction families were experiencing. And that’s where Iris Brown and Tomasita Romero came in. They started with some bright paint and a few flowers to bring the magic and beauty of Puerto Rico to Philadelphia. Romero received a fence through a partnership with the Pennsylvania Horticultural Society to keep the garbage out. And then they started planting trees. Tomasita Romero and Iris Brown are photographed. For decades, Iris Brown has been instrumental in promoting the African influence in Puerto Rican culture. In a city which is racially and ethnically diverse, just a few blocks away, the community is predominately African American. 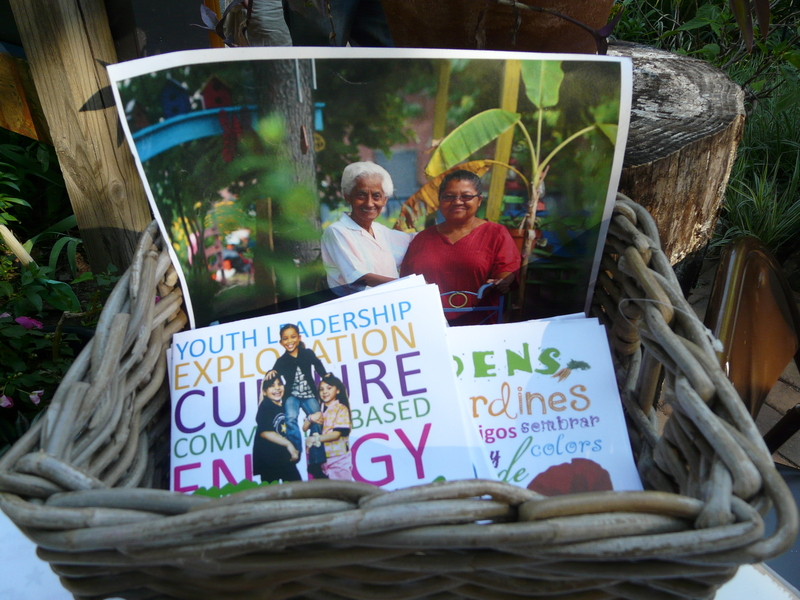 Norris Square’s goal – aside from youth development, sustainable farming and community engagement – is to bridge the gap between these two communities. In recognition of Africa’s influence , Norris Square has created The Villa Africana Colobó, a small African village in one of its garden spaces. 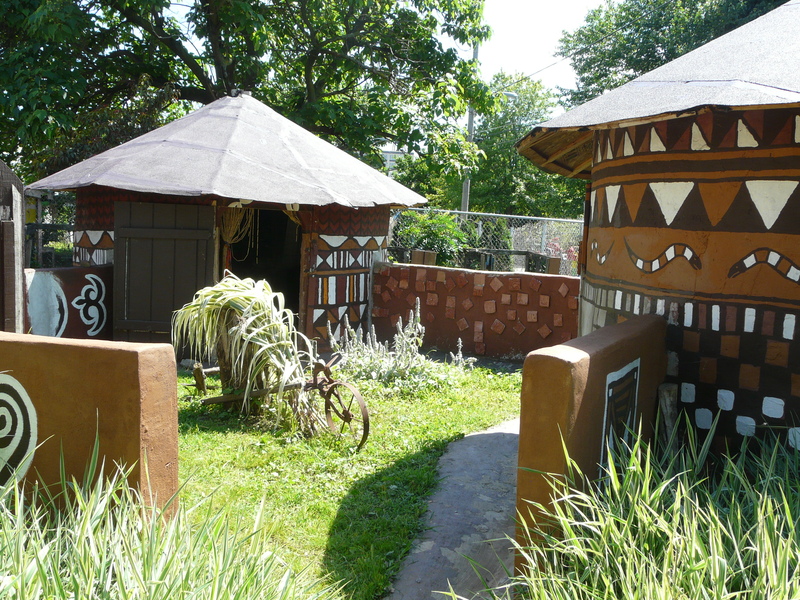 It has brightly colored huts and interior walls are decorated with African masks. During the the Festival de Bambulaé, instrument making and leaf printing instruction were available to attendees. Across Palethorpe Street, there is another garden called El Batey with grapes growing above an arbor and an enormous colorful butterfly wall mural. There are Bomba dancers from two troupes. Members are young and old, swishing their colorful skirts, swaying their hips, tapping their feet and rhythmically beating drums. Bomba is a traditional Puerto Rican dance whose origins trace to enslaved Africans on the island. 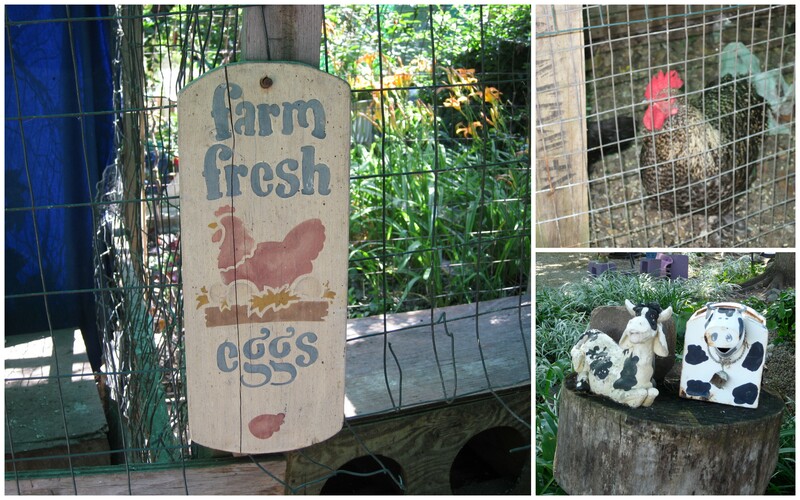 The chicken coop and other sites at the garden in Las Parcelas. 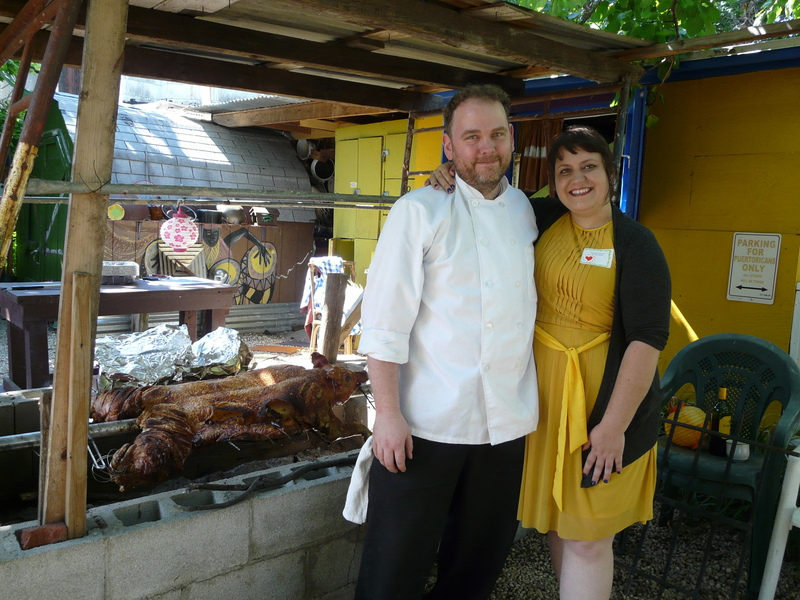 Back in Las Parcelas, beyond the guitar player and lessons on composting with worms, people are touring the garden space and feasting upon Napoleon, the pig who was roasted for six hours by McGowan’s husband, Nat, who happens to be a chef. Two women munching happily at a table across from an oregano garden work at the PHS. They’ve come here every year since the late 1980s. And PHS has had a strong partnership with Norris Square Neighborhood Project for decades. In the five years that McGowan has been Executive Director, the Norris Square Neighborhood Project has developed its youth program, which boasts impressive high school graduation rates in a community where less than 70% of boys graduate. Now they’re turning all their energy to these gardens. This Festival will raise money to help Norris Square develop community stewardship and cultural preservation. And through generous donations – given over the decades to create and maintain this program – Norris Square can throw movie nights and happy hours and plant more fig trees. Around 7:00 p.m., the festivities for the Festival were well under way. People are huddled beneath the fig trees and pear trees with plates of mango salsa, chicken and Napoleon the pig in all his delicious glory. Out on Palethorpe Street, which is blocked off for the event, neighborhood children are seen playing basketball, riding bikes and drawing with sidewalk chalk. A man named Modesto is here with his two sons. 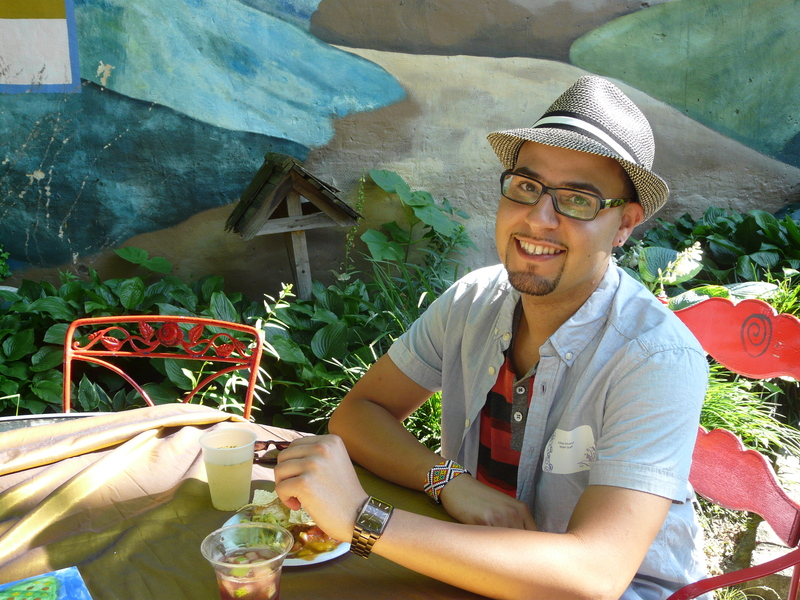 He works for Taller Puertorriqueño, a Philadelphia Latino arts and culture institution, and his wife serves on Norris Square’s Board of Directors. They come here every year to celebrate their culture and to support the work of Norris Square Neighborhood Project. 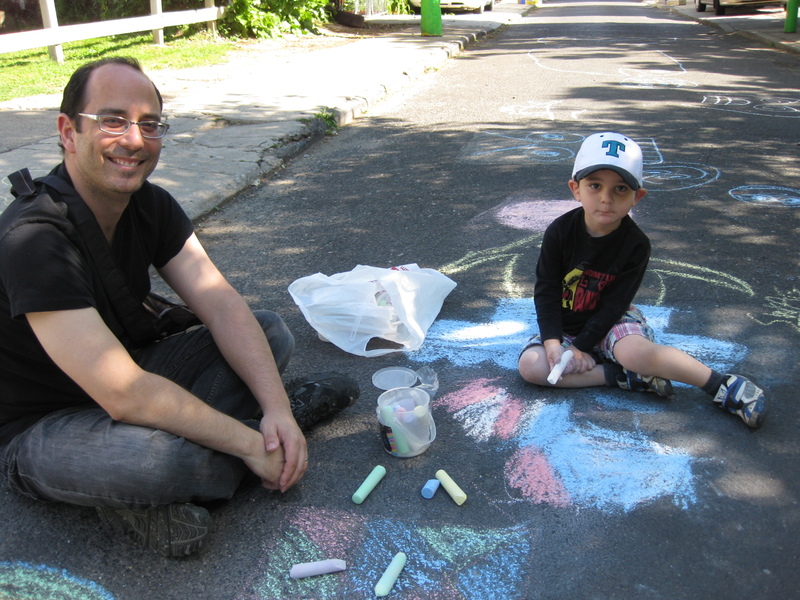 Modesto and his son drawing with sidewalk chalk. His son Sebastian is drawing a robot with blue, green and yellow chalk. He’s drawing in the middle of a street in North Philadelphia, which wouldn’t have been possible years ago. It feels safe now. He begs his father for more colors. And he’s earned them; after all, he spent his morning weeding the gardens of Las Parcelas. It’s already become his second home. The Festival de Bambulae raises money to help Norris Square Neighborhood Project develop community stewardship and cultural preservation. Visit their site for more information and ways to help. You can also “Like” them on Facebook. One of the youth volunteers demonstrates worm composting. One of Norris Square’s many murals. Chef Nat sharpening his knives for Napoleon, the roasted pig. More of the African Village. 10 year-old Guillermo in El Batey. Lisa Stephano and Maitreyi Roy from the Pennsylvania Horticultural Society.